I don’t know if it’s harder to recommend a documentary about a passionately religious, Down syndrome kid or harder to not recommend it. On the one hand, it would seem that it must be kind of touching and have some inherent interest. On the other hand, it would seem that it must be cloying, predictable, and so demanding of our sympathies that you just naturally want to reject it. Well, in this case, the choice is easy. Praying with Lior is fascinating, complicated, and moving in unanticipated ways. At the simplest level, it’s the story of a retarded boy preparing for his Bar Mitzvah. But it turns out to be about much more than that. Lior Liebling, the third of four children, was born with Down syndrome. 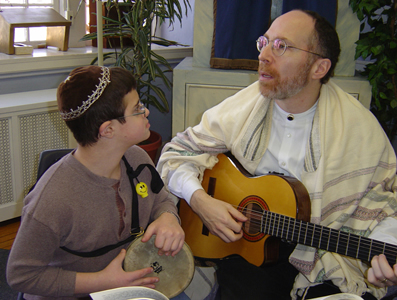 As both of his parents were rabbis, who belonged to a small Reconstructionist congregation in Philadelphia, Lior grew up with a vibrant and spiritual Judaism that flourished in a loving and welcoming community. But what does religion and the ineffable mean to the severely retarded? We never quite know what Lior is thinking. His sentences often make literal sense, though we’re never certain what the words actually mean to him. But there’s no misunderstanding his intense pleasure when he prays and sings to God. And while we can’t exactly discern his understanding of the divine, he is emphatic that God is not a man with a beard in heaven, not anything physical, not anything with an appearance. His God is a loving being who takes pleasure in the prayers of Lior and others. But director Ilana Trachtman understands that the power of Lior’s story is not in his relationship with the ineffable. When Lior was six, his mother died of breast cancer. And she made a series of video tapes for him (and presumably her other children) in which, as death approaches, we see her holding, loving, singing and talking with her son. It’s impossible not to be moved as a dying parent wonders out loud about his future, her hopes and fears for her son, a life she will never get to see unfold. Her death not only leaves the family without a mother. Lior’s father, Mordecai, is an involved, engaging and loving parent, and Lior clearly idealizes and adores him. But the mother’s death apparently placed tremendous responsibilities on Lior’s older sister and brother to become surrogate parents, filling in for the missing mother. And we see that the siblings both adore Lior and resent him, want to care for him and feel burdened with that responsibility. His younger sister is delightfully articulate about how, as the baby, she thinks that she should get the most attention, but her disabled brother will always be center stage. Her feelings seem both petty and appropriate, and she becomes like a Greek chorus reminding us of the toll that an undeniably lovable Lior still takes on the family. Though we have flashbacks to that momentous year when the mother died, the bulk of the film takes place during the months leading up to Lior’s Bar Mitzvah. It’s now seven years since the mother’s death, the father has remarried, the older sister is in college, the older brother is soon to graduate high school. And for Lior, his life comes to focus on his Bar Mitzvah day. We see him working with his father to prepare his commentary on the Torah portion for that Saturday. While he can’t grasp concepts as basic as justice and injustice, he still does have a sense of how generations of Jews love and worship God, and find joy and meaning in that covenant with the Almighty. And six years after the mother’s death, the family dynamics are more fascinating and complicated than ever. The older sister returns to help with preparations for The Big Day. And the older brother tempers his excited anticipation about college with the thought that he would never live too far away from his brother. Ever. They’re best friends, and his love and enjoyment in Lior is foundational. The younger sister still struggles with always being displaced. And completely fascinating is the role of the step-mother. She knows she can never replace the biological mother, but is aware that she has a critical role for Lior as, in her words, "the maternal in his life." The film never tries to create any suspense about how Lior will do at his Bar Mitzvah. He couldn’t blow it. He’s immersed in a family and community that treasures him. Nor does the film try to make him into some mystical Mozart- a child prodigy of the spiritual who can teach us about how to love God. Though some tend to see him as especially close to God, we know that it’s more complicated than that. Since he was a child, Lior delighted people when he’s in prayer, and he will always be a child, and thus he will always delight others by his religiosity. But we also see him singing and praying by himself. His relationship to God is personal, real to him- vibrant, ecstatic, and an abiding joy. For me, the film made me wonder about the consciousness of Down syndrome kids. What do words really mean to them, and how and what do they understand? And it made me smile at the uninhibited love that these kids bestow on almost everyone. Their hearts are open and unabashed and it’s delicious. And the film reduced me to warm butter when watching Lior’s older brother sobbing with pride and pleasure at Lior’s Bar Mitzvah. Praying with Lior doesn’t demand anything from us. It earns every moment of the joy in its audience.